It all began when design student Anaïs Bordier viewed a YouTube video and saw her own face staring back. After some research, Anaïs found that the Los Angeles actress Samantha Futerman was born in a South Korean port city called Busan on November 19, 1987—the exact same location and day that Anaïs was born. This propelled her to make contact—via Facebook. One message later, both girls wondered: Could they be twins? Thus begins their remarkable journey to build a relationship as sisters, continents apart. Over Facebook, Twitter, and Skype, they learned that they shared much more than a strikingly similar appearance. Eventually, they traveled to Korea together to discover more about the land of their separation. 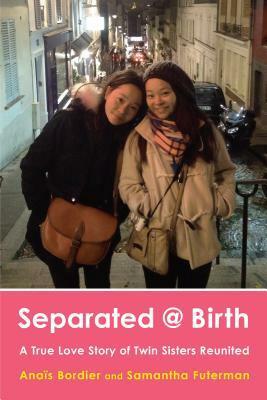 Separated @ Birth is a story that spans the world and peels back some of the complex and emotional layers of foreign adoption. Make sure to include hashtag #readpenguin in your tweet(s) to @penguinUSA. For more details on the book club, please visit this page and/or Twitter. This entry was tagged Author, Book club, Digital, Interaction, Non-fiction, Readers, Social media. Bookmark the permalink.